Continuing to repost the entries from my previous monthly blogs Back To Eventing and Back To Riding. This was originally posted on the USEA website 2010-12-01, archived with editor’s introduction here. I don’t like my shoe, the one on the right. A nail in the front is a little too tight. Call up the man and remove it, please do. I’ll stick my foot in a bucket and leave you to stew. For a life with no griefs, go buy a car. First injury and I am gutted. In his second shoeing, Roscoe got a close nail. At first, I wasn’t overly worried. Nails happen. Pull the shoe, soak the foot, apply the tape, lather, rinse, repeat. Then he went three-legged lame. The abscess had probably sealed back up. However, no amount of reasoning helps when your horse looks at you pitifully and says his foot hurts too much to make it to the water trough. After second impromptu visit from the blacksmith, Roscoe is currently wearing his shoe backwards. 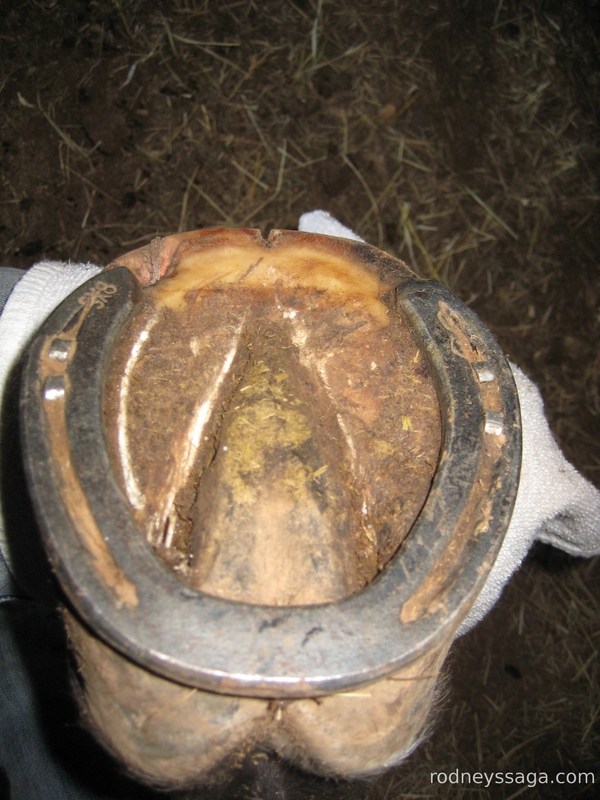 This leaves the hole in the toe open yet provides support to his thin, Thoroughbred foot. As the supporting blacksmith explained, it has the added advantage of confusing anyone tracking us. Part of the problem is that I have no sense of how much weight to give his response. A friend’s horse once soundly whacked both front cannon bones during an unsuccessful surprise attack on massive wooden farm gate. (Overgrown trail + sensitive go button + communication error, but I digress.) Leaving my friend to pick herself up, I charged after the disappearing mare. When I found her, she was holding her right front leg off the ground. Panicking, I threw myself from my horse and ran my hands down her leg. She then put it down and picked up the left. Clearly, they stung and she wanted them checked. That done, she was ready to return to the trail ride. History does not record how long it took the rest of our heart rates to return to baseline. In contrast, Caesar, my previous horse, lived in a Wagnerian opera. He didn’t have lamenesses; he had Life Shattering Events. On the occasion of his first injury, he came in from the pasture dragging his toe as if every nerve from the shoulder down had been shredded, only to trot sound. Turned out that, when injured, he was actually quite brave. It’s just that what he was being asked to suffer was more than any horse in history had ever been asked to suffer. During two decades of this dramatic approach to life, I learned to dial back his reality to match the one in which the rest of us lived. With this horse, it’s been two months. I can speak basic Roscoe but have not mastered the underlying grammar. Is he an iron horse with a legitimate grievance or a cupcake with a boo-boo? Is this healing curve normal for him or are complications setting in? Is there still an infection or does the shoe just feel weird? Either way, if you will excuse me, we have another soaking session.